Federal beer tax US revenue stamps first appeared in 1866. No stamps were produced between 1919 and 1932, during the Prohibition Era in the United States. Production of federal beer tax stamps was resumed in 1933 and discontinued in 1951. * Hogshead - as measured by American breweries, a 63 gallon capacity container, equivalent to two 31.5 gallon barrels. Several different varieties of paper were used to produce many of the beer stamps. Only examples of the major denominations are shown in the images. Printing and paper varieties will be notated in the catalog detail tables at the end of each section. For a detailed listing of all these varieties, please refer to the Scott Specialized Catalog of United States Stamps. 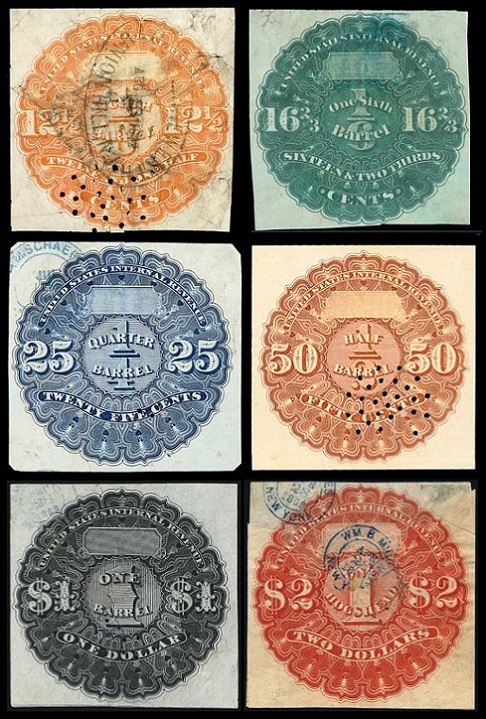 The six beer tax US revenue stamps shown above were produced in 1866. The ornate circular designed stamps were printed by the US Treasury Department. 12 1/2 C. (1866 - Sc. #REA1) - Orange. 16 2/3 C. (1866 - Sc. #REA2) - Dark Green. 25 C. (1866 - Sc. #REA3) - Blue. 50 C. (1866 - Sc. #REA4) - Orange Brown. 01 D. (1866 - Sc. #REA5) - Black. 02 D. (1866 - Sc. #REA6) - Red. The catalog valuations for these circular-shaped stamps are for cut-square examples, with ample margins on all four sides. Examples that are cut-to-shape have considerably less value. 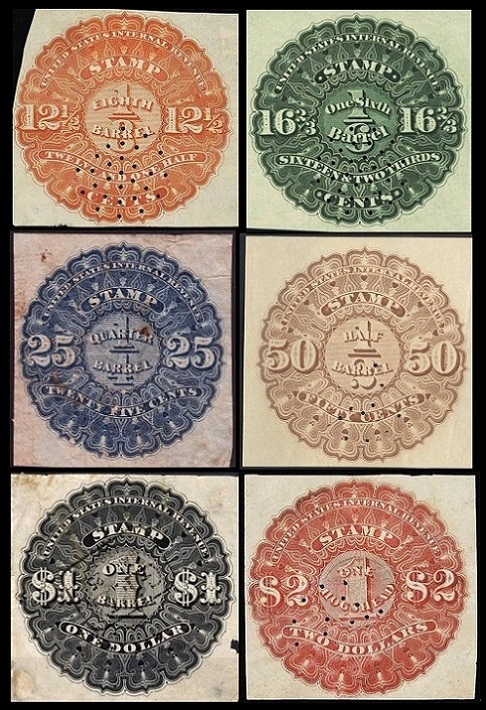 The six beer tax US revenue stamps shown above were produced in 1867. These stamps were also printed by the US Treasury Department. 12 1/2 C. (1867 - Sc. #REA7) - Orange. 16 2/3 C. (1867 - Sc. #REA8) - Dark Green. 25 C. (1867 - Sc. #REA9) - Blue. 33 1/3 C. (1867 - Sc. #REA10) - Violet Brown, Ocher Red. 50 C. (1867 - Sc. #REA11) - Orange Brown. 01 D. (1867 - Sc. #REA12) - Black. 02 D. (1867 - Sc. #REA13) - Red. 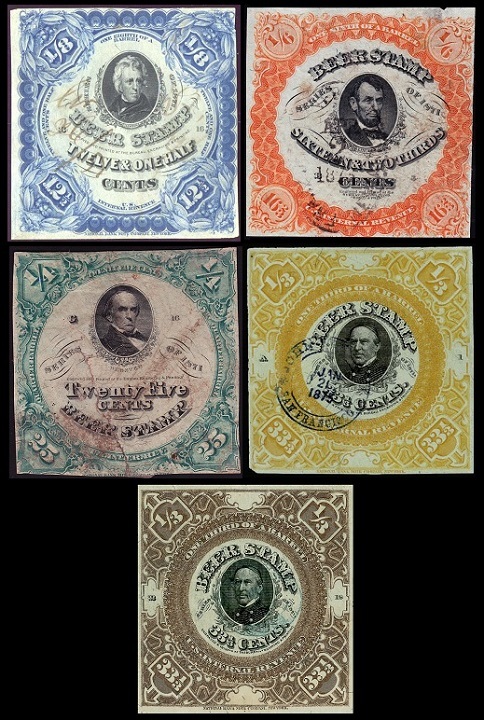 The six major type square-format beer tax US revenue stamps shown above were produced in 1870. The middle of each of the stamps features an open rectangular area, designed for the application of the cancellation. Security lines of various colors, as described in the catalog detail section below, were printed across the cancellation box in the center of each stamp. 12 1/2 C. (1870 - Sc. #REA14) - Brown - Lilac or Yellow Security Lines. 16 2/3 C. (1870 - Sc. #REA15) - Yellow Orange, Yellow Ocher - Lilac, Yellow, or Gray Green Security Lines. 25 C. (1870 - Sc. #REA16) - Green - Lilac or Yellow Security Lines. 50 C. (1870 - Sc. #REA17) - Red - Lilac, Yellow, or Gray Green Security Lines. 01 D. (1870 - Sc. #REA18) - Blue - Lilac, Yellow, or Gray Green Security Lines. 02 D. (1870 - Sc. #REA19) - Black - Lilac, Yellow, or Gray Green Security Lines. Ten new beer tax US revenue stamps were introduced in 1871. The central portions of these stamps were printed by the US Bureau of Engraving and Printing, and the colored frames were printed by the National Banknote Co. 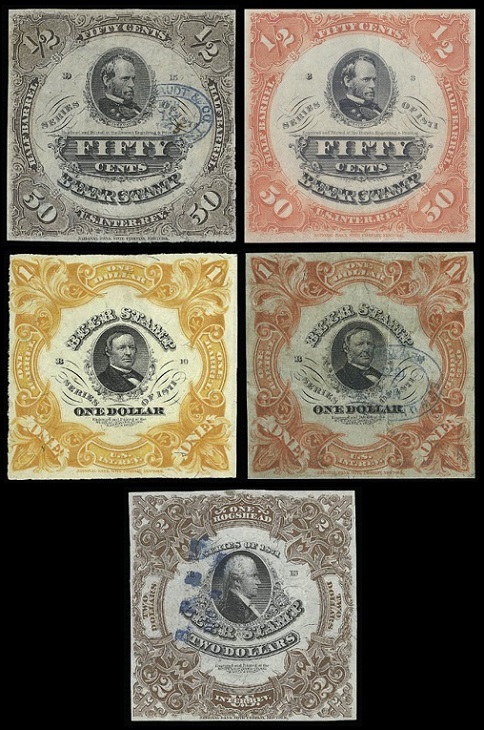 They were produced on various colored papers, and they are all inscribed "SERIES OF 1871". 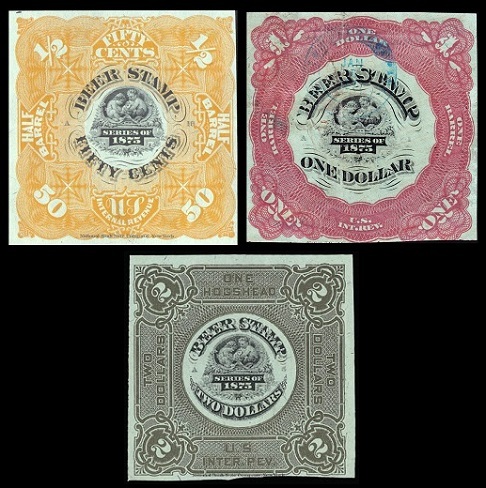 Examples of each of the Scott listed major denominations are shown above. The designs of these new stamps feature the engraved portrait of a famous American. 12 1/2 C. (1871 - Sc. #REA20) - Blue on White, Blue on Pinkish Gray, Blue on Gray, Blue on Green - Andrew Jackson. 16 2/3 C. (1871 - Sc. #REA21) - Vermilion on White, Vermilion on Pinkish Gray, Vermilion on Gray, Vermilion on Green - Abraham Lincoln. 25 C. (1871 - Sc. #REA22) - Green on White, Green on Pinkish Gray, Green on Gray, Green on Green - Daniel Webster. 33 1/3 C. (1871 - Sc. #REA23) - Orange on Green, Orange on Gray - Admiral David G. Farragut. 33 1/3 C. (1871 - Sc. #REA24) - Violet Brown on White - Admiral David G. Farragut. 50 C. (1871 - Sc. #REA25) - Brown on Gray, Brown on Pinkish Gray, Brown on Green - General William T. Sherman. 50 C. (1871 - Sc. #REA26) - Red on White - General William T. Sherman. 01 D. (1871 - Sc. #REA27) - Yellow Orange on White, Yellow Orange on Pinkish Gray, Yellow Orange on Gray - Hugh McCulloch. 01 D. (1871 - Sc. #REA28) - Scarlet on Gray, Scarlet on Pinkish Gray, Scarlet on Green - Hugh McCulloch. 02 D. (1871 - Sc. #REA29) - Red Brown on White, Red Brown on Pinkish Gray, Red Brown on Gray, Red Brown on Green - Alexander Hamilton. 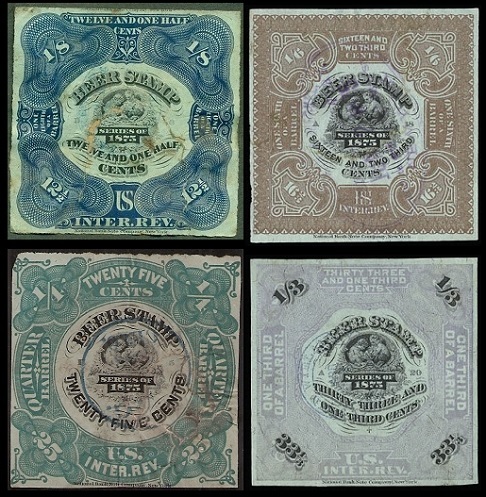 The seven beer tax US revenue stamps shown above were produced in 1875. 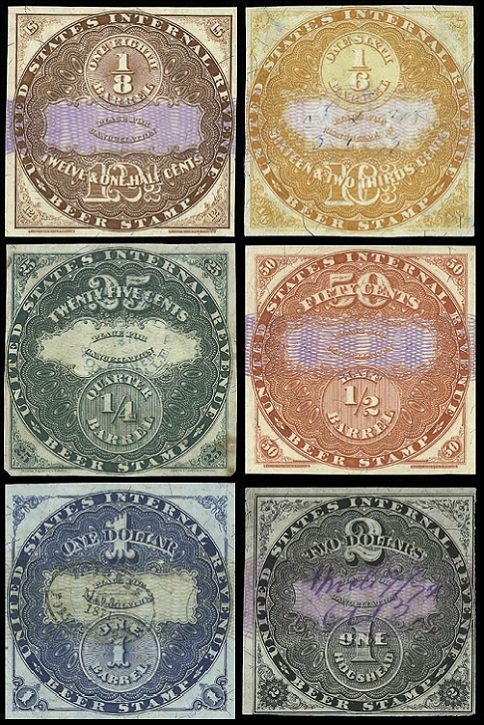 These stamps were printed by the National Banknote Co., and they are all inscribed "SERIES OF 1875". The central vignette of each of the stamps features "Bacchus Serving the First Fermented Brew to Man". 12 1/2 C. (1875 - Sc. #REA30) - Blue. 16 2/3 C. (1875 - Sc. #REA31) - Red Brown. 25 C. (1875 - Sc. #REA32) - Green. 33 1/3 C. (1875 - Sc. #REA33) - Violet. 50 C. (1875 - Sc. #REA34) - Orange. 01 D. (1875 - Sc. #REA35) - Red. 02 D. (1875 - Sc. #REA36) - Brown.